There’s little doubt that being a computer user, you are bound to come across compressed archive files, at least from time to time or possibly every day if you download a lot. Archives themselves come in many different formats but the most likely type of archive you’ll encounter will be the ZIP format. The ZIP archive was invented over 25 years ago by PKWare and is the only archive format which has built in Windows support by default where you can create, edit and extract files and folders. The ZIP format is not just restricted to archive files and can be found in special proprietary formats for games, applications, disc images and even Microsoft Office documents (XLSX and DOCX etc). Although many people might think of shareware program WinZip as the original ZIP archiver, the developer of ZIP, PKWare, released an archiver called PKZip a few years before WinZip. In 2004 PKWare released another program called SecureZIP, this is a shareware archiver with some quite unique features costing $39.95. PKWare offered version 12 of SecureZIP free of charge to everyone for a limited time around 2008 and you could legitimately download the full version from the PKWare website at no cost. Unbelievably, that giveaway link still works and you can install and use SecureZIP for free! What makes SecureZIP still a viable tool, is as the name suggests, it’s an archiver that focuses very much on security above anything else. You won’t find tons of different archive formats supported or fancy options like FTP or disc burning support, just several options for creating standard ZIP archives and securely encrypted ZIP archives. SecureZIP can create archives with a good level of encryption via 3DES (168 bit) and AES (128, 192 and 256 bit) which includes the option of a traditional passphrase or a stronger passphrase that can include spaces and other non-alphanumeric characters. Also available is advanced filename encryption and the ability to encrypt only specific files in the archive with different passphrases. That’s useful if you want to distribute one archive and grant different users access to different files inside. What is perhaps unique to PKWare products, SecureZIP has integrated digital certificate (x.509) encryption with the capability of using digital signatures to distribute more secure archives. This means your created ZIPs are digitally signed for extra security. 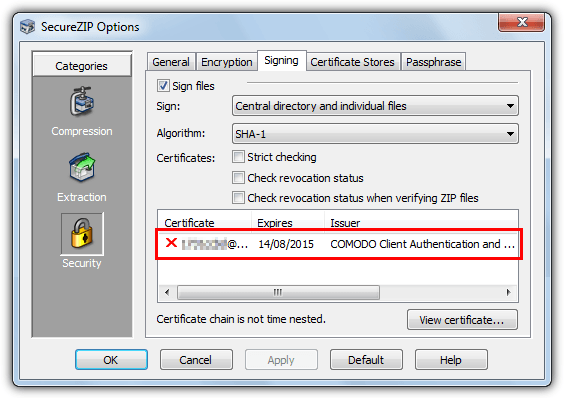 The SecureZIP program does have a facility to create a Comodo digital certificate on demand but sadly this function no longer works due to the programs age. The good news is you can go to Comodo yourself and sign up for a free Comodo Email Certificate which works with SecureZIP. The certificate is installed on your system directly from the Comodo email and then you can use it to digitally sign your ZIP archive or specific files inside the archive. If you wish to know how to export your certificate to another computer, the Comodo Certificates FAQ shows you how. Other than high levels of security, SecureZIP also offers another premium feature which is integration with Microsoft Office via an included PKZIP plugin. You can choose to let SecureZIP automatically open ZIP archive content in an associated program if the archive contains a single recognized file such as a DOC or a PDF. There is also an Outlook plugin that can automatically compress attachments into a standard or secure ZIP before sending. The main Office integration feature will add either some menu entries (Office 2003) or a new tab (Office 2007/2010/2013) to your Office applications. It can open a ZIP archive and the containing document inside when you browse for it or compress the Office file straight out to a standard or secure ZIP. 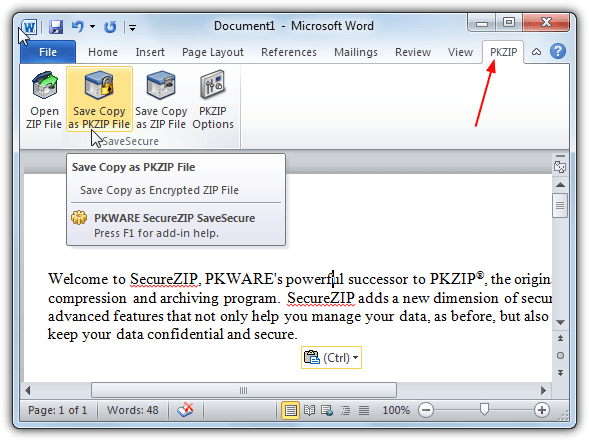 We tested this feature in Office 2007 and 2010 and it worked great, the tab in your Office program will be called PKZIP. Besides those special features, SecureZIP supports all the functions a decent archiver might have, such as creating a self extracting executable, testing archives, a favorites list, a list file system to batch add files to an archive, ease of use wizard and default folders. It has support for creating ZIP, EXE, TAR, JAR, and opening ZIP, PKSFX, BZ2, TBZ, BZ, CAB, TAR, GZ, TGZ, RAR, LZH, LHA, ARJ, UUE, XXE, HQX and JAR archives. 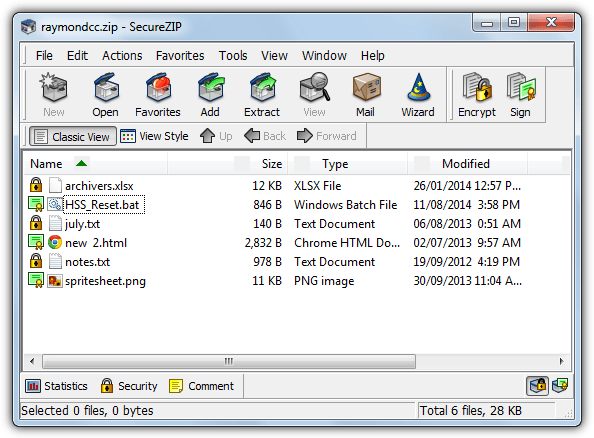 SecureZIP might not have all the latest features such as support for 7Z or ZIPX but it’s a very capable archiver with a feature set still not available in many of the popular free or paid archivers around today. While it’s available for free, SecureZIP is a tool well worth adding to your collection. A great piece of software and far lighter on resources than WinZip which is slow and inefficient. I like the integration of SecureZIP into Microsoft Office which makes it easy to share files securely with colleagues, SecureZIP is more secure than WinZip and is the choice of the federal government and many financial institutions so most places can accept files encrypted in that format. I too am amazed that link still works but they did promise, when PKWare released the software, that it’d be ‘free for life’. Obviously they’ve not updated the software since the giveaway. For anybody concerned IT IS legitimate software and the SHA1 hash is: 1117225EDBF4842570DA3E8229183A5A4F8B228D. It is also signed with an Microsoft Authenticode digital signature. Personally I purchased the latest version of SecureZip (14.40.0028) as it’s only $29 and comes with free updates for 1 year; the licence is perpetual (for life) however. The latest version DOES have support for 7Zip as well as ZIPX. The formats supported are: ZIP, ZIPX, 7-Zip, ARJ, BinHex, BZip2, TAR, BZip2, GZip, TAR, GZip, LHA, RAR, TAR, UNIX Compressed (Z), UUEncode, XXEncode. My recommendation is that people use traditional passphrases instead of digital certificates to encrypt with because if you only use a digital certificate, and you lose/damage/forget the certificate’s backup password, you’ll lose access to your files. Nothing wrong with using both though (certificate AND passphrase) – then it’ll open automatically on a system with your certificate on it. Far more convenient. thanks again raymond.cc.. you rock!!! Thanks for the software.i have downloaded it and i will test it. This is a really helpful software ! I really like it !! !